HYDERABAD: Akaky Akakievich Bashmachkin was born in St Petersburg. He works as a clerk at some unremarkable (but nonetheless, let’s have no names) government office in his hometown, and gets paid 400 rubles every year for his efforts. There is nothing especially distinguishable or memorable about him, nothing that can be worth a story. But his is the story, written by Nikolai Gogol, which is the subject of the memorable quote ‘We all come out of Gogol’s Overcoat’ – famously attributed to Turgenev, Dostoevsky and other later Russian literary greats. Bashmachkin is a copying clerk, he likes his job the way you like any regular routine of yours – it is what you do, and you are comfortable doing it. He is good at his job apparently, and is glad to do nothing more than this specific job. His earnings allow him a merely existential standard of living, alone in a small room in the shabbier parts of town. He is content, however, in this small life of his; and the only bit of sadness in his life is the condition of his overcoat – much-used, much-repaired and much-patched-up. When the bitter Russian cold comes along again that year, Bashmachkin takes his overcoat to the tailor, Petrovich, who pronounces the overcoat irreparable, and that Bashmachkin will now have to get another coat. But where will the money come from? Petrovich suggested that a new overcoat would cost a-hundred-and-fifty rubles, but Bashmachkin could understand that eighty rubles would give him a serviceable one. Still too much money. As fate would have it though, Bashmachkin gets a gratuity from office, and this enables him to buy …. yes … his new overcoat! Was Bashmachkin ever so happy! What follows is the tragedy of Bashmachkin losing his overcoat in a street mugging, and the futility in his trying to register his case with the authorities, and even being rebuked by a ‘Person of Consequences’ for bringing in such a meagre matter to his attention – to eventually his death, brought about equally by the loss of his overcoat, the sadness about his loss, the shame of the rebuke and the bitterness of the Russian winter. On the surface, this is a simple story of an everyman, his tribulations, and a final denouement. But when you go deeper, you’ll see a satire of the c o n d i t i o n s of Russia in the early 1800s, and a parable of the yoke of feudalism and how it crushes individuality. Bashmachkin is the representation of the common man that is victimised under a feudal command system and its social and economic structure. 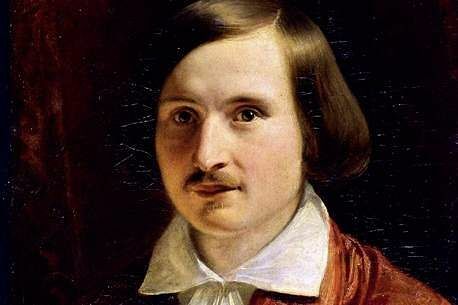 Gogol is considered the father of realism in Russian literature, and he, along with Pushkin brought about the emergence of Russian literature as we know it. He wrote about the people on the ground, his protagonists are everyday people, their troubles are your troubles and mine. ‘The Overcoat’ is essential reading. Eighty rubles to save me from winter Akaky Akakievich Bashmachkin is an unremarkable character created by Nikolai Gogol, but his struggle to buy an overcoat to shield him from the harsh winter exposes the evil of feudal command system in Russia.